©2011 DreamWorks II. All Rights Reserved. Photo by Dale Robinette©2011 DreamWorks II. All Rights Reserved. 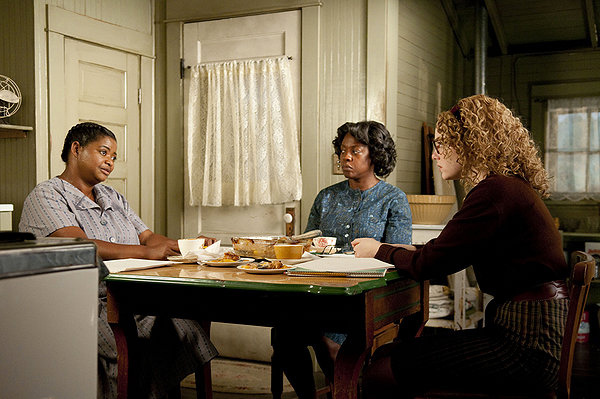 Taylor as director and Green as producer saw the magic and the truth in their friend’s book [as did millions of readers of the bestselling novel], and withstood many forces, with humor and grace, to bring about a film based on the book, THE HELP. 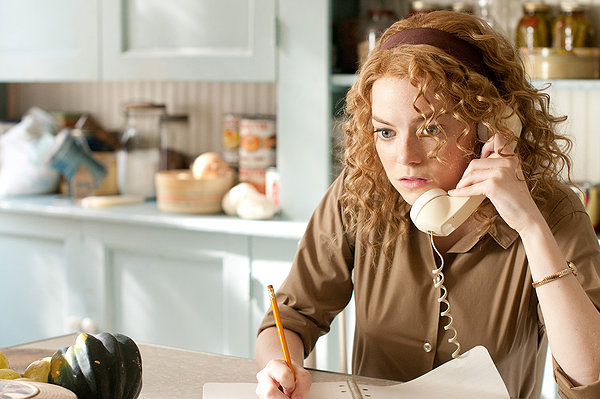 They sought “help” for the film from some of the very best, from Production Designer Mark Ricker and Set Decorator Rena DeAngelo SDSA to an astounding cast, led by Viola Davis and Emma Stone, to top notch production crews. Many of them were strangers in a strange land, all so taken with the story they would be telling that they were willing to brave the mugginess and mosquitoes of a Mississippi summer. 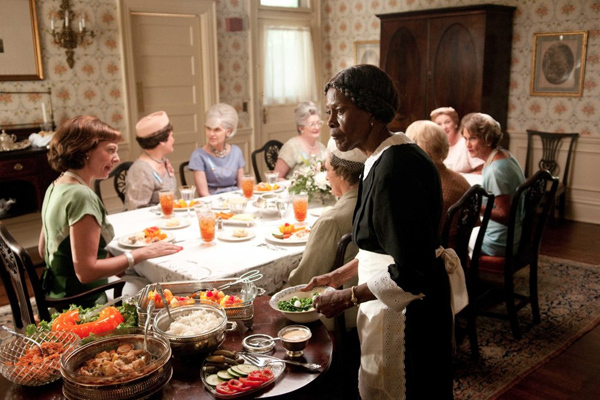 The set decorator graciously chats with SET DECOR—once you spend time in the deep South, you don’t “interview”, you chat—about the experiences of making this film about friendship, and the friendships involved…and the times not so long ago. You and Mark have worked together on several projects, Mark & Tate are long-time friends…how did this tie into your collaboration? What was your process on this film? Mark and I started designing this movie months before Tate had even secured financing. We took a leap of faith and followed him to Mississippi for a preliminary scout of the small towns Greenwood and Clarksdale. It was fantastic, you could feel the book come to life the minute we drove up! We could envision each of their houses—there was Skeeter’s house…it was Skeeter’s house! And there’s Ceila’s house, this one is Elizabeth’s house. Exactly the way Kathryn had described them. From that point on, Mark and I knew what we wanted the film to look like. We wanted all the houses to not only feel like these people actually lived in them, but to be an extension of their characters. For reference, we used books, magazines, documentary footage, and family photos from all the people we met. We also got a lot of ideas from the houses and locations we scouted. Tate wanted us to re-create the Jackson of his childhood—he told us hours of stories of the Jackson he remembered. Then, he let us go wild. He completely trusted our judgment and encouraged us to have fun with it. 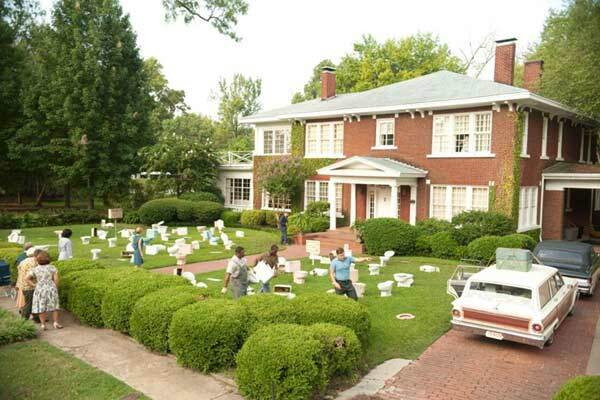 The beauty of shooting this movie in Mississippi was that it was all there. I really thought I was going to be driving all over creation looking for all the dressing. But aside from the four trips we made to Memphis, we sourced much of it in the fantastic antique malls of Mississippi. Every one of them was a treasure trove of some aspect of Southern life. We were lucky enough to have a fine antiques store right in downtown Greenwood, Russell Thomas Antiques. 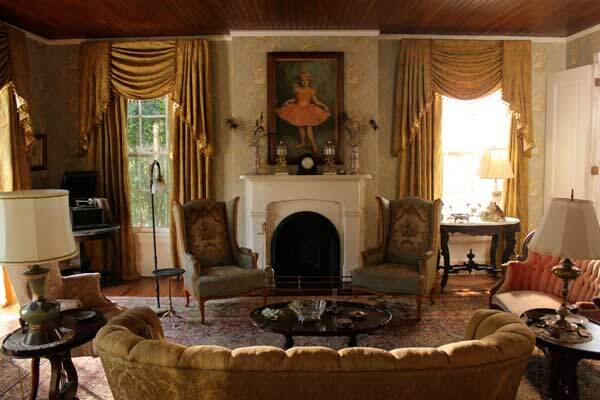 He has an amazing collection of fine antique furniture, art, lighting and rugs. We rented all of the most beautiful pieces from him and supplemented with great items we found on our shopping trips to Jackson and Canton and Memphis. As for location, I loved every minute of this film. We all had houses and would get together after work and every weekend for dinner or a much-needed pool party. Plus, the people of the town loved having us there and could not have been more hospitable. We had as much fun when we were working as we did on the weekends. I think this comes through in the film. We all knew we were making a great movie and having fun doing it, and that doesn’t happen often. The locals were the key to making this movie. When we first started talking about filming in Greenwood, I asked, “Where am I going to shop? This town is 90 minutes from anything, in the middle of cotton fields…” Tate and Brunson told me, “Don’t worry. All the people will open their houses to you and you can shop from their attics. I said, “Okay, that’s very sweet and all, but I can’t decorate a movie like that.” They weren’t exaggerating, though. These people were unbelievable. After being there for two weeks, I knew everybody in town and they were literally opening their houses to me. It was crazy. Crazy wonderful. I used family photos from locals, and so much more. I met the two local estate sale ladies who hooked me up with everyone else in town. It was amazing. I would call and say, “Katherine, I need a changing table from 1961.” And she’d say, “Well Pam has three, just go knock on her door.” And when I did, there were Pam and her husband carrying a perfect changing table down the steps! She told me where her keys were hidden so I could go in when she was away and borrow anything I needed. I was also given access to a department store in Greenwood that had been closed for 30 years, intact! It had all the display cases, shelving, mannequins, lighting fixtures, bolts of fabric, signs, hundreds of unopened boxes of blinds from 40 years ago, Christmas decorations and window displays. I spent weeks in the store, which was about 105 degrees and absolutely filthy, with the 89-year-old woman whose family had owned it since the ‘50s. A true Mississippi character and a hard bargainer! But that store was a gold mine. Then there was the appliance dealer who had been replacing 1950’s and 1960’s appliances for 30 years and had kept the old ones in a warehouse out in the country. All I had to do is ask another guy in town if he knew where I could get 1960’s toilets. He puts me on the phone with this appliance guy, who said “How many do you need?” I said, “50”. Three days later, I pulled up to his warehouse out in the middle of nowhere Mississippi, and there were fifty 1950’s and 60’s toilets all lined up for me. It was like nothing I have ever experienced before. Shooting this movie in the summer in Mississippi was very hard. The shooting crew had an enormous air conditioning unit that followed them everywhere. The set dressing department did not. And of course, we’re either dressing the sets ahead of the shoot or wrapping them and breaking it down afterwards. Many of the interior spaces in Mississippi were air-conditioned, but not necessarily when we were dressing them! That’s why you see an air-conditioner stuck in the window in one of the set photos of Skeeter’s bedroom. We had to carry it with us and plug in while dressing the set. All the plants and flowers on Skeeter’s front porch, which was in real life the exterior of another house, had to be replaced daily because the heat killed them. The local nursery was bringing in truckloads of flowers and plants for us every single day. And the humidity and mosquitoes cannot be described. It was not a terribly glamorous summer. 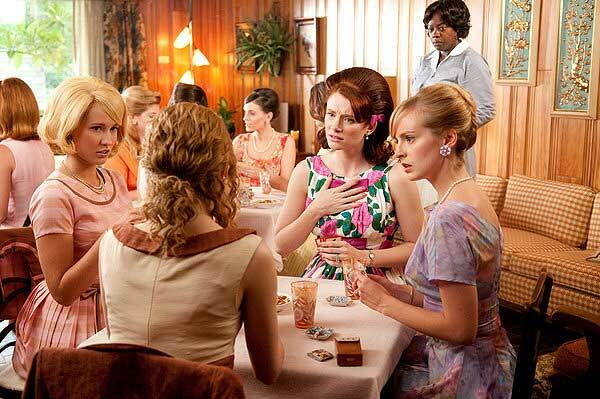 But Hilly Holbrook [Bryce Dallas Howard] was all about glamour…or thought she was. Tell us a little about her house. We wanted each set to depict the very different personalities of each of the characters. Hilly’s house was obsessively perfect, very beautiful, but cold. We chose the icy silver wallpaper in the dining room and the thistle fabric on the sofa in the living room to reflect her chilly, thorny personality. Her home was like her character, all about appearance. 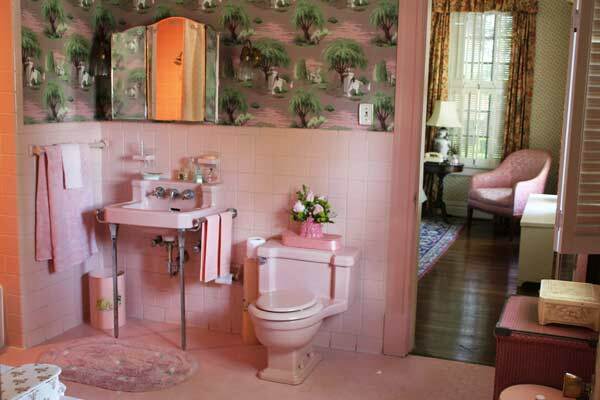 And the pink bathroom! Hilly would have bought that amazing wallpaper because it looked like Johnny Foote’s house…her old flame, the one thing she wanted and couldn’t have. We pictured her house to be Better Homes and Gardens 1962 modern. 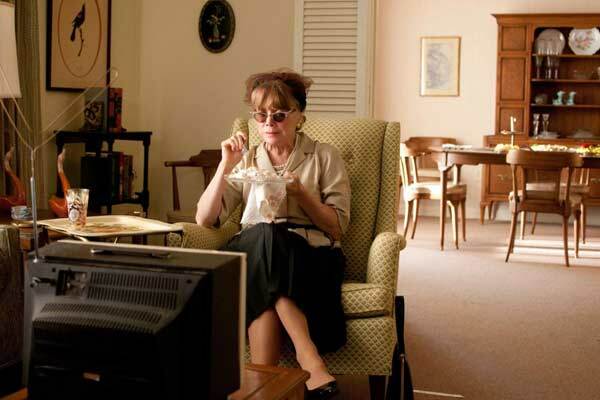 Elizabeth wanted to be sophisticated like Hilly but couldn’t quite afford it. The house we shot in was perfect. It was built in 1959 so it was the height of modern in the day. 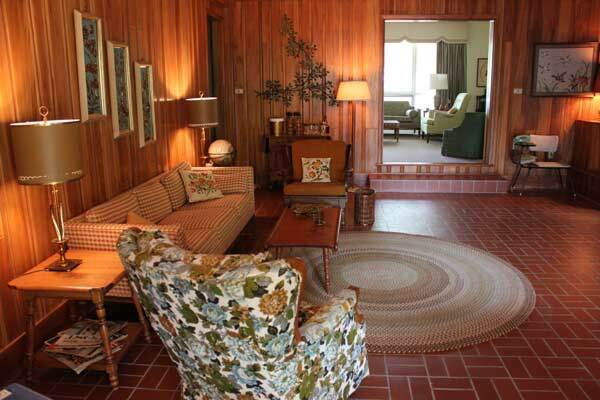 The inspiration for the den where the ladies play bridge was the orange plaid fabric on the sofa. That keyed everything else. The more casual den is a contrast to the formal living room where we see Hilly’s mom, Missus Walters [Sissy Spacek], watching her “stories” [soap operas] while they play bridge. I enlisted the help of the local ladies, who explained to me the finer details of bridge parties. Everyone would have individual ashtrays, always put tablecloths on the card tables, etc. When Tate and the crew came into this set, they all said it felt just like their parents’ house when they were growing up, so we knew we’d nailed it. This was the house Celia moved into after she married Johnny Foote. 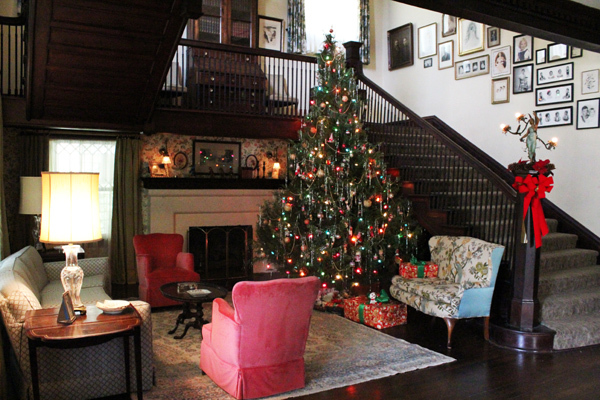 It had belonged to his grandfather, so it was a house with history, re-decorated in the 1920’s and mixed with layers of previous generations…furniture from another era, or eras…someplace where Celia would feel completely out of place. 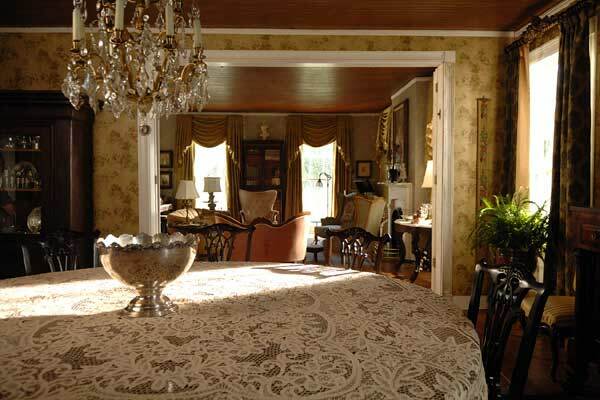 Since it was the only Antebellum house, I wanted the drapes and furniture to be heavy and oppressive, a complete contrast to Celia’s personality and costumes. Celia’s bedroom was the one room in the house where I added some of her personality. The satin sheets, airy shawls and feminine perfume bottles added to a room filled with dark wallpaper and heavy wooden furniture. The only place Celia belonged in this house was near the pool. 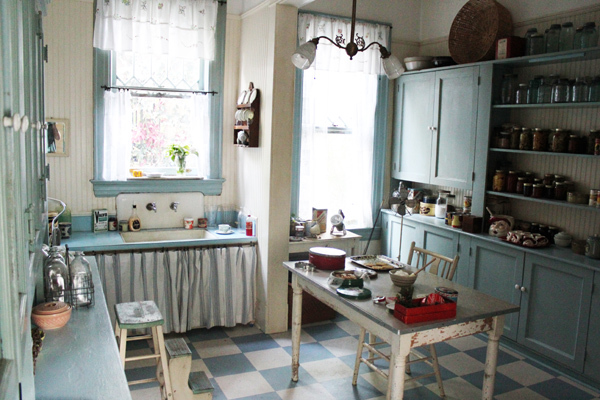 We built the kitchen in the existing kitchen of the location house, which was originally built in the 1870s. It was important to Mark that the kitchen be within the house and not on a stage. He wanted to see out the windows to give the audience a sense of the location. He designed the set to cover the existing contemporary kitchen. 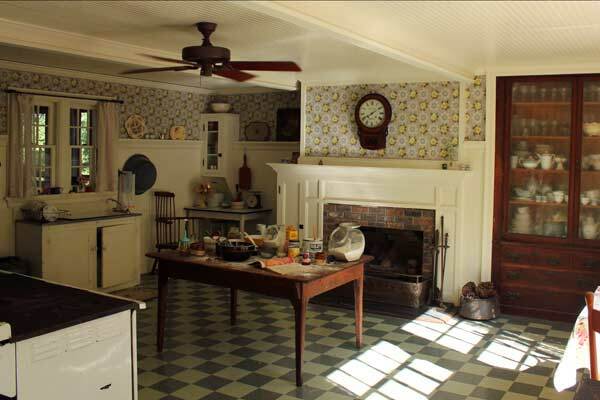 It was such an enormous room that we were able to conceal every modern detail and turn it into the kitchen that would have been in the house when it was “re-furbished” in 1925. One of my favorite shots is of Celia sitting with Minny at the tiny window table in the kitchen. That shot tells half the movie in one frame. I loved this set. It was a massive house and we dressed almost the entire thing. We wanted it to be a grand house, but one that was lived in. It was a farmhouse, but Charlotte was a former beauty queen, so we tried to bridge that gap with the furnishings. We think she decorated it when they were married and not much had been done to update it in the more than 20 years since. We mixed family heirlooms passed down through the generations with more “modern” furniture from the 40’s and 50’s. Every house we visited was full of taxidermy and botanicals. I borrowed much of the taxidermy that we used from local hunters, and the Audubon prints and botanical paintings were available in every antique store I shopped. 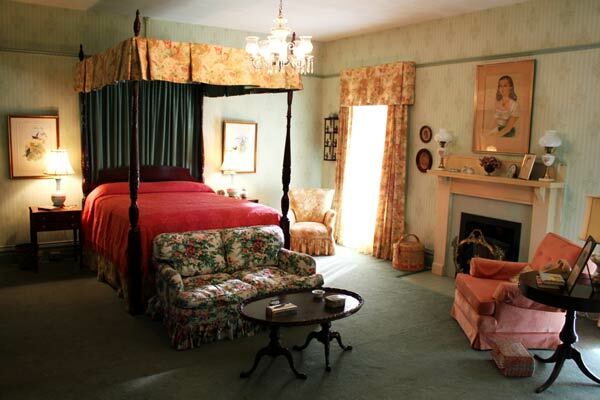 You’ll see them not only here in a “country” house, but also in the more modern Leefolt house! The fabrics are contemporary but have such a great vintage look. Some of the chairs we found in surprisingly perfect condition, but most we had re-upholstered. That was the case for all of the houses. Thankfully, I found the most amazing upholsterer. He worked out of a tiny garage next to his house and he did beautiful work, and quickly. He could upholster a tufted sofa in 2 days! I found a few local drapers and a workroom in Jackson to make all the drapes. There were endless draperies! 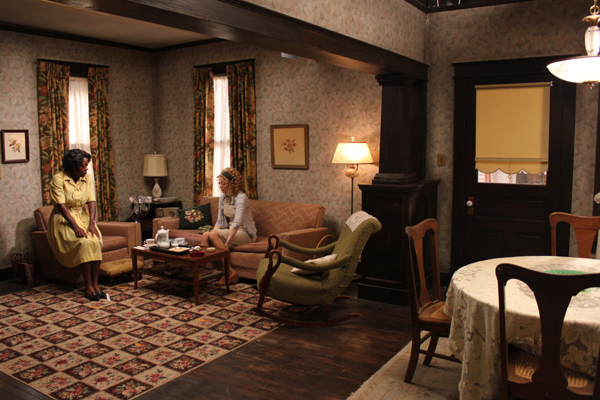 We love wallpaper and used it extensively throughout the film. If you see wallpaper in this movie, whether looking fresh or weathered and aged, we put it there! All of our sets were our wallpaper choices, but much of Greenwood seems to love it now, too, because most of the people kept them up after we left! Skeeter’s bedroom: I wanted it to look as if Charlotte had decorated it for her when she was a girl, but over time it had taken on a lot of Skeeter’s personality as well. The horse collection, all the books, touches from her high school years are layered with a few college-age elements. And now she’s home and adrift. The room reflects her and her history, but it’s not her future. Now we see her in her one corner of current identity, at her typewriter. Charlotte’s bedroom: It’s Skeeter’s parents’ bedroom, but with Charlotte’s over-riding personality and the focus on her dealing with cancer, it’s definitely Charlotte’s bedroom. 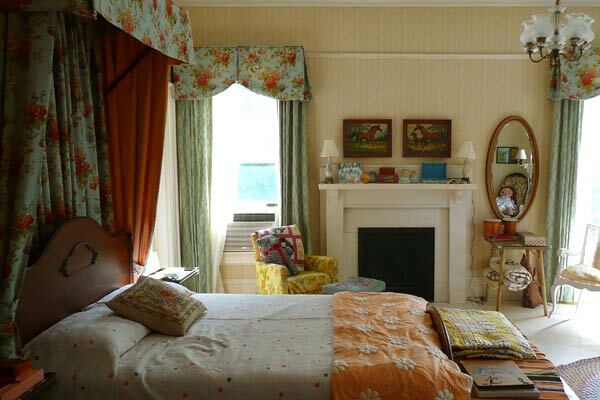 We wanted the room to be completely feminine without a trace of her husband. The portrait over the mantel is actually of the woman who owns the house. When we were scouting the location, Mark and I noticed the resemblance to Allison, so we asked for permission to use the painting in the movie as Charlotte in her former beauty queen glory. Kitchen: We were able to tear out the old kitchen and replace it with everything from linoleum to cabinets. The wallpaper is vintage, the ephemera from Robert Gerwig. The red chairs were a last minute addition. I had something else in mind but could not find what I wanted. Then I was talking to a woman at the local farm stand, who said, “I’m trying to sell these red chairs. Do you think you may need them for the movie?” I liked them because they didn’t match the table and they give the room a shot of color. Everyone in town had something to sell or give or show me. 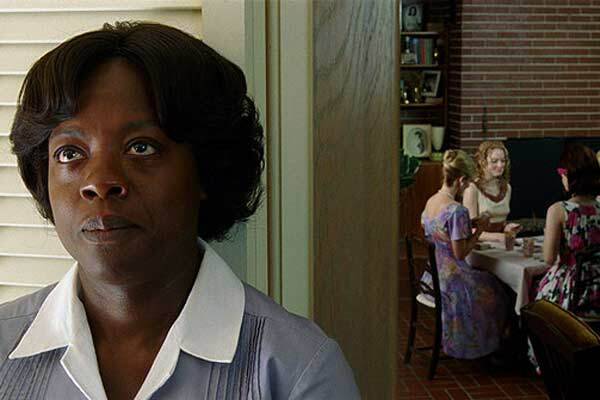 Aibileen Clark’s [Viola Davis] house was quietly stated, composed but full of care. 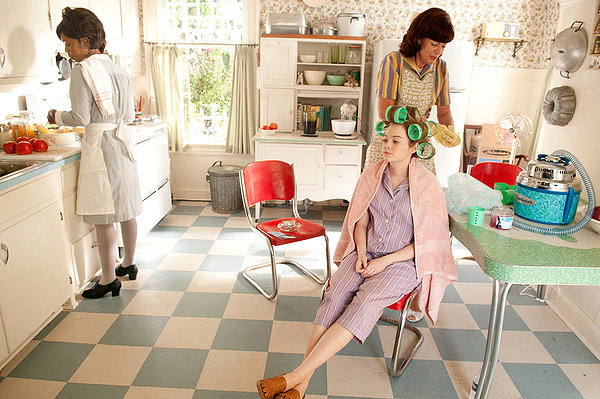 Aibileen’s house, like all the others, was an extension of her character. I wanted it to be very homey but to show its age. The colors were much more somber and muted. Since the shotgun houses where many of the domestics still live in Greenwood were much too small to shoot in, we built Aibileen’s and Minny’s houses. Aibileen’s was based on a former maid’s house we visited in Baptist Town, a neighborhood in Greenwood. Here, and from our research, we found not shacks, but small houses with bold wallpaper and fabrics. These women didn’t have much money, but they were proud people and kept their homes just as nice as they kept their employers’ homes. Aibileen’s living room started with a vintage wallpaper, then I found the perfect sofa and the room came to life. A lot of the furniture had been handed down from former employers, so it worked out beautifully that most of Aibileen’s furniture came from an estate sale. One of my great estate people took me to preview a house before they packed it up for the sale. A caretaker for the church had lived there for 45 years. 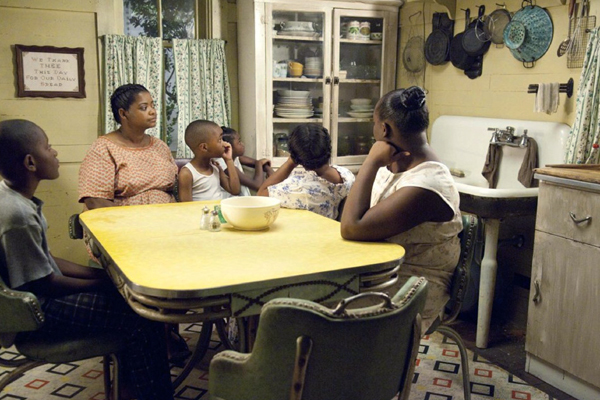 I said, “I’ll take it all.” Minny Jackson’s [Octavia Spencer] house does have the shotgun look, especially with the living room/bedroom sharing open doorways with the kitchen. A glimpse into family life of a domestic: when the work day is done, their work isn’t. Yes. Minny’s life is problematic. But it was important to show that despite all she had to deal with, her place was clean and her children cared for. And of course, she’s a standout cook, so the scenes had to take place in her kitchen. The movie theater that Skeeter observes in the beginning of the film while getting gas was the theater Director Tate Taylor went to as a child. It closed down in the 1980s. Could you tell us about this? The art department re-created the Capri sign and by adding a few movie posters, the theater came back to life. They then added the stairs and “colored entrance” sign on the side of the building based on a research photo we had. It was eerie seeing the segregation and realizing this wasn’t 100 years ago, this was in my lifetime. I think it was a very significant moment in the film. The people of Mississippi were so incredibly helpful to us. They lived this life and told us their stories and guided us through re-creating a time in history that many aren’t proud of. But they still wanted it to be portrayed correctly. We could not have made this film anywhere else.